PALA, CA – Tonight Gary Shaw Productions in association with Greg Cohen Promotions, Antonio Leonard Promotions and All In Entertainment presented ESPN “Friday Night Fights” to a lively crowd at the Pala Casino Spa and Resort. Every fight was sensational as all fighters went to war with each other. In the 10-round main event, Rustam Nugaev (27-6-1, 17 KOs) and Marvin Quintero (25-5, 21 KOs) provided the fans with a rugged night of action. Quintero was using his hand speed and lateral movement to get off his punches while Nugaev was establishing a ferocious body attack. Both fighters were landing power shots, but it seemed that Nugaev was landing the harder blows. It was a close fight after four rounds but Quintero hurt his hand in the final seconds of the round. Once the doctor deemed Quintero couldn’t continue the fight was ruled a TKO in Nugaev’s favor. 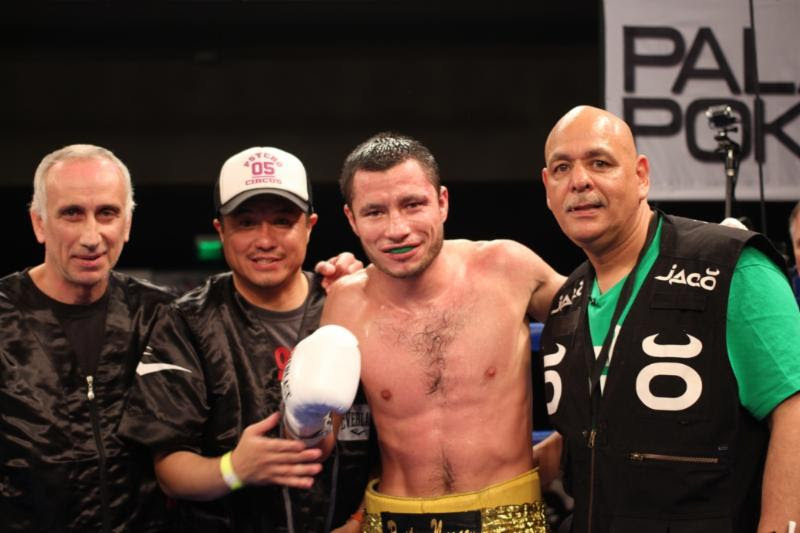 In the 8-round co-feature, undefeated bantamweight sensation, Roman Morales(18-0, 9 KOs) and rugged Russian warrior, Khabir Suleymanov (16-4, 6 KOs) went to war as the fight went the distance in a crowd pleasing fight. Morales set the tone early as he came forward landing hard body shots. Suleymanov hit the canvass in the second round as a left hook from Morales landed on his head. Suleymanov was game and continued on, landing some good right hands but never seemed to hurt Morales who kept coming forward. Morales dropped Suleymanov three more times before the bout ended. Suleymanov was cut on both eyes while Morales was bleeding from his right cheek. Both fighters showed a warrior spirit but it was Morales who looked sensation in victory. Morales won by unanimous decision. Scorecards read 80-68 and 79-68 twice. (6-round Welterweight bout) – Unbeaten welterweight Dusty Harrison (21-0, 11 KOs) marched on with a hard fought victory against a resilient Michael Balasi(10-4, 7 KOs). After being wobble by a powerful left hook from Balasi in the second round, Harrison came back with a left hook of his own that sent his opponent to the canvass. Toward the end of the round, Balasi landed another left hook and dropped Harrision as the crowed was on its feet. Harrison got up and fought smart the rest of the fight, dominating the last four rounds. Harrison dropped Balasi again in the fifth round in route to a unanimous decision. Scorecards read 60-53 and 59-53 twice. (8-round Lightweight bout) – In a rematch, undefeated lightweight star, Alejandro Luna (17-0, 13 KOs) demolished Sergio Rivera (18-15-2, 11 KOs) by way of a first round knockout. A powerful combination by Luan that ended with a left hook to the chin of Rivera ended the bout. (4-round Jr. Welterweight bout) – Kenneth Sims Jr. (1-0) dominated Cory Muldrew (1-6) in his first professional fight, winning every round convincingly. A powerful left hook to the body sent Muldrew to the canvass in the second round as Sims Jr. marched on to a four round unanimous decision. Sims Jr. showed he has the talent to become something special as he displayed a variety of great skills. Scorecards read 40-35 across the board. (4-round Bantamweight bout) In his pro debut, amateur standout, Eduardo Martinez (1-0) defeated Juan Urbina (0-2) by way of a four round unanimous decision. Martinez came right out of the gate and applied pressure on Urbina as he landed power punches throughout the entire fight. Martinez looked astounding. Scorecards read 40-36 across the board. (4-round Featherweight bout) – Rising star, Mario Barrios (3-0, 1 KOs) dominated Lionell Kelly (0-3) over four rounds in a featherweight bout. Barrios landed a left hook to the head of Kelly in round two that send him to the deck. Kelly got up and finished the bout but Barrios looked impressive. Scorecards read 40-35 across the board. (4-Round Welterweight bout) – Franscisco Santana (19-3-1, 9 KOs) blastedJorge Pimentel (27-22, 20 KOs) with two vicious body shots in the third round, ending the welterweight contest in dramatic fashion. (4-Round Super Featherweight bout) – Aaron Garcia (14-3-2, 4 KOs) andThomas Herrera (3-10-1, 1 KO) went to war for four rounds but it was Garcia who won every round. Scorecards read 40-36 across the board.